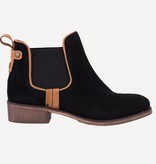 The Bruno bootie by Mark Jenkins is an easy must-have for any wardrobe. Featuring a beautiful black suede exterior with contrast piping in a tan leather, it also features double gore sides for ease of wear. Comfort meets style in this boot . ● Low 1-inch block heel.